KJIPUKTUK (Halifax) – I’m going to go out on a limb here and make a statement I haven’t heard anyone make before: The front entrances of Halifax City Hall and of the Legislature should be modified to include ramps. The first time I went to City Hall as the guest of Mayor Savage I felt like I was now a part of the history of my city. On my first visit to the Legislature to visit Speaker of the House Kevin Murphy I got emotional. To get into either building I had to go through a back door. The City Hall door on Argyle Street is locked. To get in I had to press a button and explain to the disembodied voice in the speaker why I was there, listen for a click as the door was unlocked, then press the door opener button to come in. When inside I could see a Commissionaire pop his head out the door at the foot of the staircase. At the Legislature as well I had to go around to the back of the building. After someone let me in I came into the lobby from under the stairs. I then crossed the lobby to go through security. To me these buildings represent democracy, and they belong to all citizens. That means all citizens should enter these buildings the same way, through the same door. Rich poor, private or admiral, it doesn’t matter. It isn’t a life or death issue, to be sure, but it’s symbolic. Democracy must be equal and accessible to every citizen. Listen: The house where writer Enest Hemingway was born, in Oak Park Illinois is ADA(Americans With Disabilities Act) compliant. I am willing to bet Joe Howe would support modifications to historic buildings if it would correct inequalities among citizens. And a proper design, a considered design that takes into account style and appropriate construction materials, would not “deface” the spirit or character of these buildings. Our society is changing and adapting to new realities that could never be anticipated in the 1700s and 1800s. The physical expression of our democracy can stand to be made more inclusive. 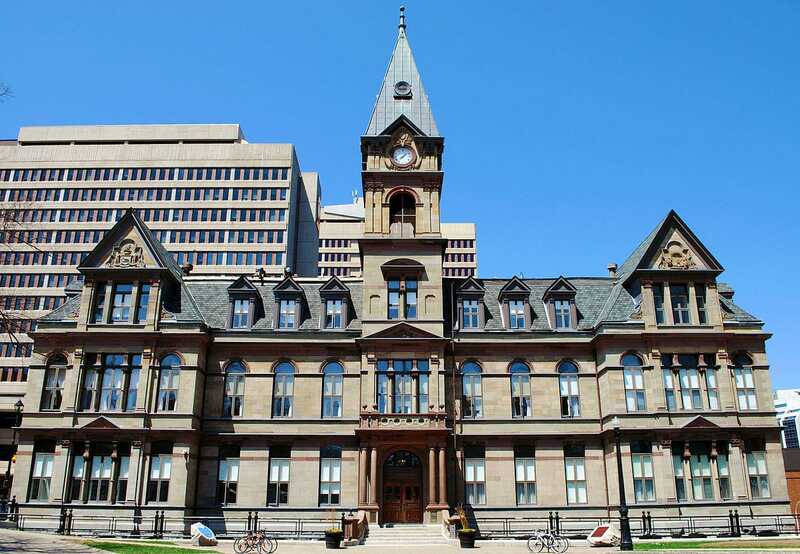 I get butterflies every time I go to City Hall or Province House. To be able to enter the same way every other citizen does would reflect the ever increasing role of disabled citizen like me. There’s nothing dignified about always having to go to the back or side of a building to use an accessible entrance. Then once you’re inside, you sometimes have to go further to get to where you would be if you could just go through the front door like everyone else. Go down this hall, take a left, through that door… Also, a ramp is only accessible to someone who is capable of propelling a manual chair up an incline, someone who has a companion with them to push them, or someone in a power chair/scooter. I am unable to propel up ramps so buildings with ramps are inaccessible to me. If I’m going somewhere I’ve never been before, I have to call first to find out if there’s a level entrance or a ramp. Fortunately, Access-A-Bus operators will push wheelchair users up ramps and if I take a cab, I tell the dispatcher to let the driver know I will need a push up a ramp so I don’t get a cab driver who doesn’t want to (or can’t) do this. As for those who are more concerned with the appearance of a historic building than the rights of a person with a disability to have access to a public building, I roll my eyes. Wheelchairs have been around as long as those buildings have, geesh!